Do Geelong community want a cycle and pedestrian friendly city? On Saturday June 15th Cycle Geelong will host a Geelong Cycling Forum: a public discussion about community bicycle transportation, covering aspects such as safety, infrastructure and networks in Geelong. This forum comes at a crucial time in the region with numerous transport strategies underway amongst very low commuter cycling. According to the latest census only one percent of Geelong’s citizens use their bikes to get to school or work. Geelong Cycling Forum host Mik Aidt, a journalist from the cycling city of Copenhagen, Denmark, will speak with guests Barton van Laar of Bike Safe and Rod Charles, local cycling enthusiast. 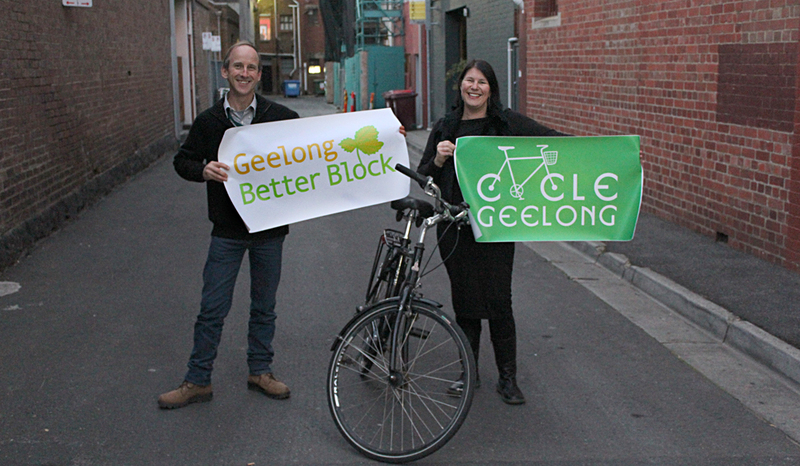 Special guests at Geelong Better Block for the day include Jason Roberts, cofounder The Better Block, USA; Tamsin O’Neil owner of the Australian cycling magazine ‘Treadlie’, as well as the ‘Green Magazine’; and our very own The Bicycle Show radio personalities, from The Pulse FM. The audience is invited to join the debate on cycling and Idea Bomb a cycling vision for Geelong. The lack of continuous bike lanes in Geelong makes commuter cycling a hazardous and dangerous journey. In Copenhagen continuous and dedicated ‘Copenhagen bicycle lanes’ are used weekly by more than 50 percent of its citizens. The Forum speakers will focus on how to normalise cycling in Geelong, ranging from community engagement and questions of critical mass to cycling infrastructure, regulation of vehicle speeds and traffic behavior. If we’d like to see change, then what could be the driver to create that change? With Geelong residents experiencing greater levels of obesity and poor health, improving the city infrastructure, slowing vehicle speeds and changing our car culture has the potential to improve health and save significant cost. Studies internationally shows that benefits of cycle and pedestrian friendly cities include improved health benefits (study: 1,200 km on bike = 1 less sick day); carbon emission reduced (study: if Australian population cycled as regularly as the Danes, its overall CO2 emissions could be reduced by one quarter); air pollution reduced; less traffic jams and parking problems. Regardless of what your helmet will or will not do for you, it is clear that bike lanes and other infrastructure do make riders safer. Protected bike lanes reduce injury risk up to 90 percent, according to a study published in the American Journal of Public Health. Another thing that has been shown to help on the safety issue — and this is Europe’s big secret to success — is the experience that more bikes on the streets creates safer cycling. In other words, the only thing that’s really going to make cyclists safer is hitting a critical mass of ridership that may trigger a cultural change in Australia. But will that become reality in Geelong without a more supportive infrastructure? The Geelong Cycling Forum will be held in Beav’s Bar, 77 Little Malop Street, at 1pm on Saturday June 15th as part of the Geelong Better Block, where community demonstrates changes they would like to see in our city.